Over at Culinary in the Desert, Joe posted his recipe for Eggnog Spiced Spritz Cookies as part of his holiday baking spree. So I went off in search of my cookie press. And came up empty. I can’t remember the last time I used it but I’m sure it’s in our house somewhere — probably in one of those boxes that remain unpacked from our move over two years ago. But still, the craving for buttery, noggy cookies called, so I made Joe’s recipe and shaped them into rounds. The result is a bit softer than I’m sure the spritz cookies would be, but they remain wonderful. I added a bit more rum and vanilla extracts to the glaze because I love when those flavors pop, but you should play with the flavorings as you see fit. My changes are reflected in the recipe below. Preheat oven to 400 degrees and line baking sheets with parchment paper. In a medium bowl, whisk together flour, nutmeg and salt. In a large mixing bowl, beat together butter and sugar until smooth and creamy. Mix in egg, rum extract and vanilla until combined, scraping down the bowl as needed. Add dry ingredients and mix just until combined. Scoop a heaping tablespoon of dough with a spoon, roll it into a ball, and flatten it to about 1/4-inch thickness before placing on the baking sheet. Cookies should be spaced about 2 inches apart.Press dough into cookie press with desired shaped-plate. Bake until the edges are golden, about 8 to 12 minutes. Remove and let cool on the baking sheets for about 1 minute before transferring them to a wire rack to glaze (recipe follows). Yields approximately 3 dozen. In a small bowl, still together confectioners’ sugar, melted butter and enough warm water for desired consistency. Stir in rum and vanilla extracts. 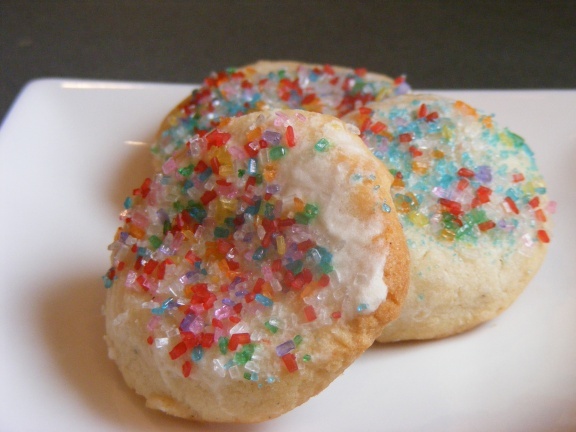 Glaze by dipping the tops into the mixture or brushing it over the warm cookies. Sprinkle with sugars or candies before the glaze sets.